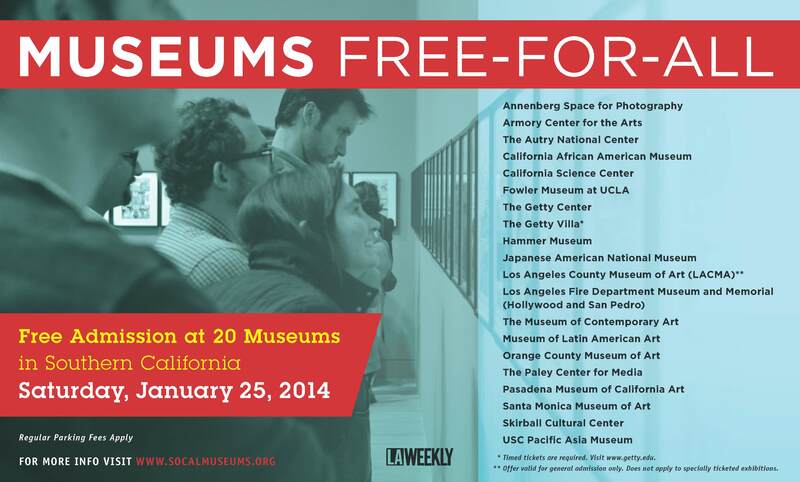 In a joint effort to present the arts and culture to the diverse and myriad communities in Southern California, SoCal Museums (previously the Museum Marketing Roundtable) announces the ninth annual “Museums Free-For-All” Saturday, January 25, 2014. The museums—presenting art, cultural heritage, natural history, and science—will open their doors and invite visitors free of charge. This offer is for general museum admission only and may not apply to special ticketed exhibitions. Regular parking fees apply; consult individual museum websites for hours and other visitor information. SoCal Museums unites the diverse museums of Southern California in joint marketing and communication efforts to increase visitation and membership in museums in the Los Angeles metropolitan area. SoCal Museums leverages the museums’ collective strengths, working together to reach current and potential museum goers.